Gathering for a festive party with friends, you’re probably more than once wondered how to attract attention and be the centre of events. 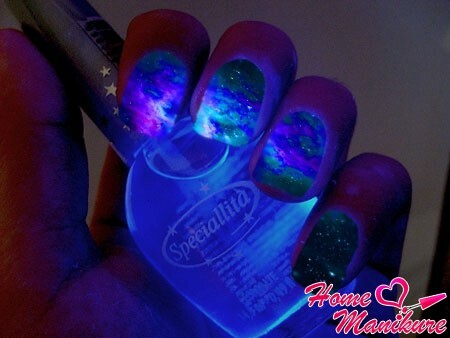 For lovers of night life appeared a great find in creating a unique image – a glowing nail polish. Your manicure not only distinguish you from the crowd and attract a lot of admiring and curious glances to your persona. 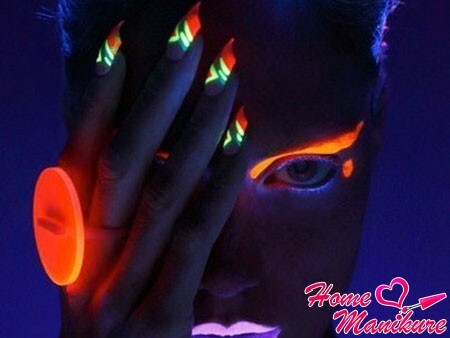 Glowing varnish can be applied both on natural and artificial nails. In both cases, you get a bright and noticeable effect. Varnish can be painted nails completely or to create different patterns. In addition, it is useful as an intermediate layer between the decorative and the top-end finish. This can be done if the luminous nail polish has a translucent tone, which will be visible through the main drawing. Happy like manicure indistinguishable from ordinary, and at night you get a bright and noticeable nail art. All these tools can be divided into two groups: the reflective and light smack. On how you plan to use a luminous nail polish, and your choice depends on its purchase. After all, one can only reflect coating, for example, ultraviolet rays without absorbing them, and the other capable of being charged from daylight and give it a night. So you do not get confused, we suggest you study a brief description of the most common structures for manicure. Neon nail polish refers to the group reflective coatings. Its effect can be seen only under ultraviolet light – in the dark does not shine. On the market to the colour palette is quite scanty, but it contains a bright flashy colors: green, yellow, orange and others. Happy nail looks very lively and catchy.Under ultraviolet light color, usually saved, and the coating begins to shine brightly. Similar property holds fluorescent nail polish. As you remember, there is a second group of agents which are capable of absorbing at first, and then give light energy. The operating principle of many lacquer phosphorus known since childhood.Green stars on the ceiling that glow at night, you can still be found on store shelves. Phosphate nail polish is a translucent liquid gel with or without shade. In the darkness, it shines blue or green colour.Today phosphorus coating hardly used because it contains harmful ingredients . Luminescent varnish has more extensive properties. It “burns” not only under ultraviolet light, but also in total darkness with the proviso that this was to obtain the necessary charging for 3-5 minutes on natural or artificial light sources. This ability can be explained by the presence in the composition of the phosphor 33 TAT, which has nothing to do with phosphorus and “burns” 20 times brighter (about an hour – active radiation, a quarter of the day – the extinction), as assured manufacturers. 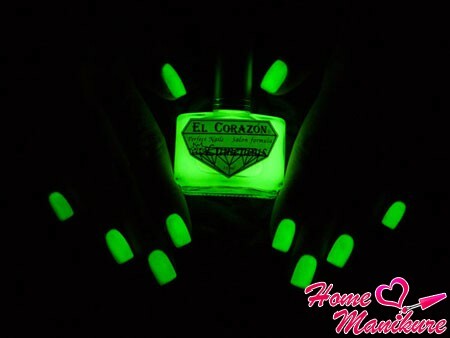 Due to its composition luminescent nail Nail is waterproof, non-toxic and safe for your health . Phosphor is a powder, which, if desired, can be purchased separately and make luminous coating by adding another component, for example, gel nails. Before purchasing be sure to ask the seller to what species the coverage you selected. 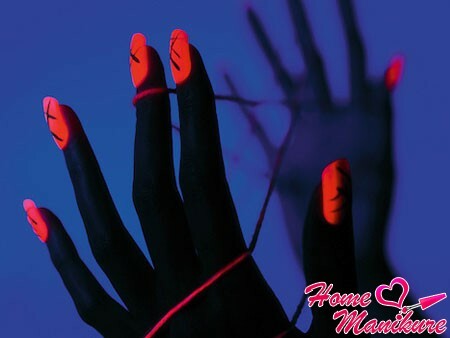 After all, if you, for example, gain neon nail polish, you can enjoy its glow only club or karaoke bar, which features ultra-violet lamp. If the long-awaited acquisition is already stored in your cosmetic bag, it’s time to think about the future design. 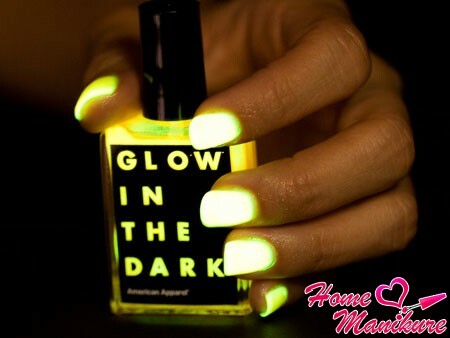 Luminous nail polish is applied in the same way as normal. It can be used as a coating or monotonous focus on a single figure, which will attract the views of others in the dark. Very original colour jacket looks: long “special” tips look impressive and stylish. 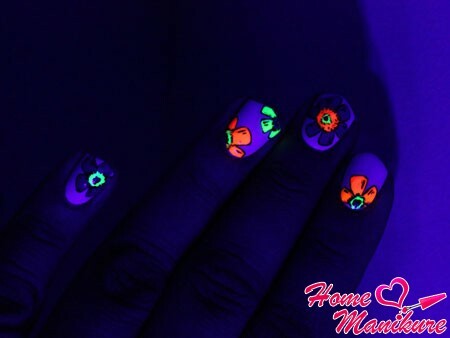 Using fluorescent nail polish, try experimenting with different shades. Paint each finger in a certain colour and enjoy club music, amazing dancing girls and guys next bright rainbow on hand. Draw some interesting ideas for creativity in our photo collection.